The Linksys app is a free mobile application that allows you to securely access your home network, router features, settings and configuration from a mobile device. The Linksys EA9200 and Linksys EA9500 Smart Wi-Fi Routers support Smart Connect which allows the routers to select the best Wi-Fi band for connected devices to maximize the network’s Wi-Fi speed and performance. This article will give you instructions on how to disable the Smart Connect feature using the Linksys app. On the Dashboard, tap the Menu icon (three bars). Toggle the switch to the left to disable the Smart Connect feature of your router. If you wish to enable it, just toggle the switch to the right. NOTE: If Smart Connect is disabled, all three (3) bands will display. You may need to configure each accordingly. Tap on Save to apply the changes. 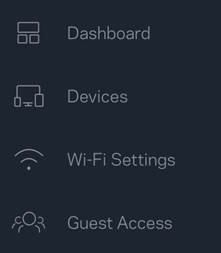 You have now disabled the Smart Connect feature of your router using the Linksys app.